The new apperance, the new experience with Bullet Strike! Get ready for the most beatiful version so far! 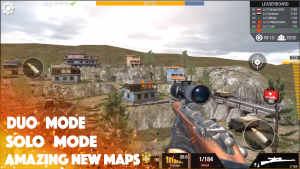 With this version 0.9.1.1, amazing modes combining with impressive maps will bring to you the most enjoyable experience of a perfect multiplayer sniper game. Now, not only you can play in PvE mode as normal, but you can invite your friends in Solo Mode and Duo Mode to fight in team and win the battle as well. Majestic map called Death Valley is also open, where you will be deep in a very new view never seen before. But it is not all, it is the first time Slot Machine – Jackpot was integrated into the game, now you can easily spin Jackpot to accumulate golds then upgrade other powerful weapons faster. Don’t hesitate to update and enjoy the game now! Bullet Strike version 0.9.1.1, breaking all limits of a sniper game!